This topic contains 17 replies, has 2 voices, and was last updated by Alexander Bautz 3 years, 7 months ago. I have upgraded to the new JSLink(7/31/2015 version) and am experiencing a few rather strange issues. I have attached images of the issues listed below. 1. When I access the form it is not loading with the dynamics present until I refresh the page a few times. 2. There is no name listed in the Editing section of the DFFS backend page. When the rules are created and saved, it is saved with the name “undefined”. 3. After the dynamics are created and saved, whenever the DFFS backend page is accessed no dynamic information such as rules, tabs, etc. are found; however, if I view the properties of the “undefined” record in the SPJA-DynamicFormsForSharePoint list the rules are listed. Another issue was brought to my attention when someone attempted to access the same form I mentioned above. The following error message was received regarding the “SPJS-vLookup.js” plugin failing to load; however, when I go into the plugins folder of the DFFS I do not see plugins using that naming convention, I see the backend/frontend names. Please see attached. Thank you again for all of your work developing these tools for all of us to use! I suspect this loading problem is related to the “Minimal download strategy” setting described below. When it comes to the plugin name, this is a bit confusing, but its referring to either “SPJS-vLooup_frontend.js” or “SPJS-vLookup_backend.js” – depending on what part you are loading. It seems this is a problem with the “Minimal download strategy” setting (if you look at the URL you have “/_layouts/15/start.aspx#” in front of the list name. I have made an effort to try to support this setting, but it looks like it is not working as expected. To fix this you must turn off this under “Site Settings” > “Manage site features” > “Minimal Download Strategy”. I did deactivate the “Minimal Download Strategy” feature and the “/_layouts/15/start.aspx#” has been removed from the front of the list name; however, the DFFS settings are not saving properly. When I set up the Tabs it will work in the form, but when I go back into the DFFS settings the backend form does not have any of the previously saved settings and the configuration in the SPJS Configuration List still has the item listed as “undefined”. Are there any particular screenshots I can provide to help determine the cause of the issues I am facing? Can you post the URL of the form you are entering the backend from, and the URL from the backend when this is loaded? You can change the domain name to “contoso.com” if you like. If you are using IE, you must press the little “play” button to the right to execute the code. Paste the output here (change domain name). I have finally recreated this bug, and have released a patch to the v4.306 version of DFFS frontend. Can you please test this one and let me know if the issue is resolved? Sorry for the delay – I’m in Norway, and I guess we have some time difference. You replace the file “DFFS_Frontend_min.js” in the folder “/SPJS/DFFS/js” with the one from the linked zip-file. I have loaded the patch file and am experiencing a long delay in loading the form, and am unable to launch the dynamics backend page. Sounds like this may be related to the same issue mentioned in the other JSLink comment. I am at a loss as to what I am supposed to do to make the product work, and cannot express how much I appreciate all of your help on getting this to work for us. Sorry about this. Something funny must have happened when I minified the file. I tested and got the same error as you, but then I redid the minification without changing the source file, and now it behaves properly in my setup. Can you download it and test this again? 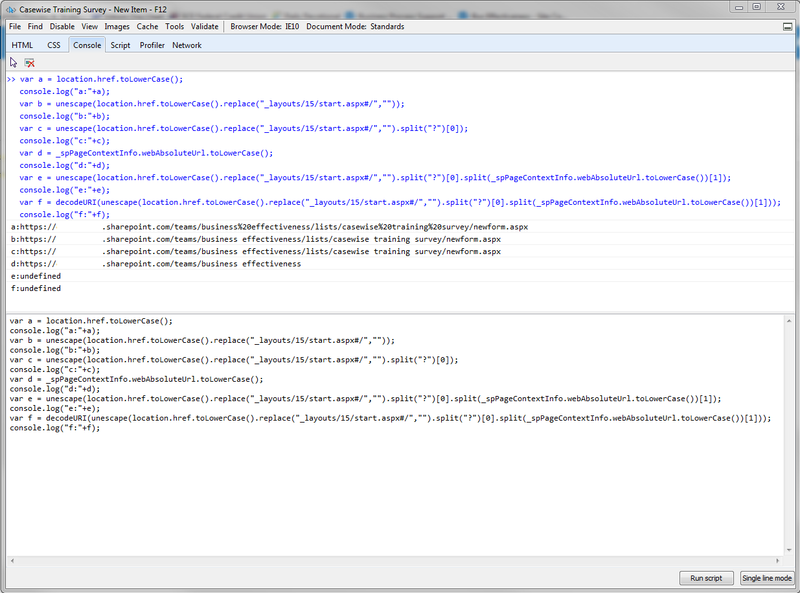 PS: I have now zipped only the DFFS_Frontend_min.js file and not the full “package”. If I experience any issues over the weekend I will document and reach back out to you. Have a great weekend! I’m glad it worked. Please let me know if you have any questions. Sorry for the delay in my response, Ive been pulled to other projects lately…so I had a chance to get back to the DFFS and the vLookup appears to be working, but I do have a functionality question. When you choose to prefill the child form from the parent form, are you able to prefill dropdown columns on the child? I am currently using cascading in both the fields for the parent and child, so Im wondering if that is the reason I cannot prefill these fields. This should work, but it might be a timing issue where the cascading dropdown is created before the value is set using vLookup. Then activate the “Write debug information to the top of the page” setting in the cascading dropdown config. Now you should see the “Single line of text” field below the dropdown – does this have the correct value?